Jeremy Kong is a two-year-old Chinese-American superhero out of California. With Jeremy’s Acute Myelogenous Leukemia (AML) diagnosis in June 2012 and impending bone marrow transplant in the next several months, Jeremy’s parents, family, friends and community out in California (with help from the Asian American Donor Program) has been leading a very strong campaign to find him a bone marrow match. There is currently no available match in the registry. Jeremy Needs You has created a social media page at the Jeremy Needs You Facebook Page, which is a steady stream of drive announcements, updates on Jeremy’s condition, and resources to become registered as a donor. Jeremy Needs You has been successfully creating drives on the East Coast, and I’ve been in contact with Jeremy’s aunt Yvonne to attempt to get one started in the DC area. She will be flying out to DC on October 7, 2012 to run a drive at Chinese Community Church of Greater Washington in Silver Spring, Maryland. 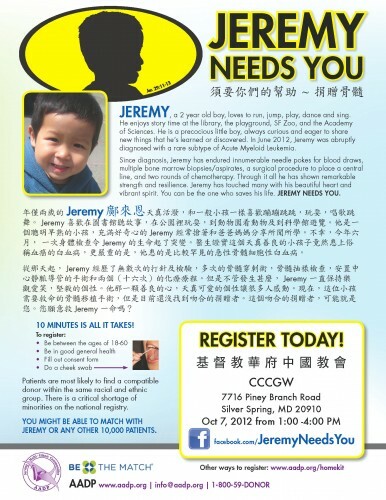 Please help spread the word about this drive and help save Jeremy’s life! DoSomething.org is an awesome organization that seeks to empower teenagers to actively participate in campaigns to create social change. They currently have several active campaigns listed across a variety of topics: voting, animal adoption, poverty, texting and driving, bullying, and more. They also offer a number of contests, scholarship opportunities, and resources to mobilize America’s youth. I wish I had known about a similar organization when I was in high school, as everyone I’ve been in contact from the organization has been responsive and extremely dedicated to their mission. This year, DoSomething.org’s Give A Spit About Cancer campaign is back, bigger, and better than last year. In partnership with Be the Match we will seek to mobilize college students to run bone marrow donor registration drives on their campuses. College students are the most in-demand donors on the registry. The 2012 program aims to launch drives on over 200 college campuses and sign up 15,000 new donors. There’s a real need for registered bone marrow donors in the US. Why? Only 30% of patients in need of a bone marrow can find a match within their family. The other 70% rely on complete strangers. Young people need a concrete action they can take that doesn’t require donating money or fundraising. Give A Spit About Cancer is simple, free, and potentially life-saving. The campaign runs from September 24 – November 15, 2012, and results from the different college campuses will be announced officially in December. Drive participants are eligible for prizes which will be announced soon! Janet Liang passed away last week. I’ve put off posting my thoughts on her passing until now because I wasn’t sure what my thoughts were. 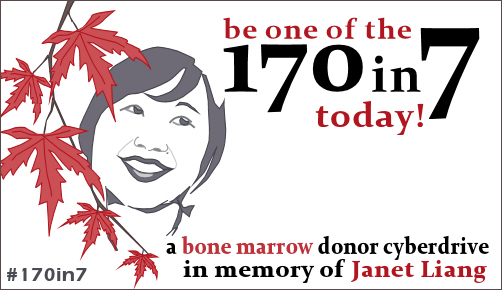 But with this new cyber initiative adopted by several leaders in the Asian American online community to register donors this week in Janet’s honor, I think it’s an appropriate time to share about Janet’s impact on my life and on Cheekswab. I didn’t personally know Janet, but our paths crossed a little. I heard her voice on a White House conference call and she heard mine. I sent her a message on Facebook that understandably never got a response. I commented from time to time on her Facebook status updates. She liked Cheekswab on her Facebook account. For someone I’ve never met, Janet had a very strong impact on significant aspects of my life. The launch of Janet’s viral video on reddit coincided with the launch of Cheekswab, and I received emails from people wanting to donate because of Janet’s plea. I ran two drives in Janet’s honor earlier this year, as people who saw her video became convicted to give part of themselves in hopes of saving her. She struck a chord in the consciousness of thousands of people across the Internet. She advocated for a cause more personally and successfully than anyone who came before her. Team Janet registered over 10,000+ new donors from high-need ethnic groups in this year alone. She will save hundreds, potentially thousands of lives through those registrations. She just couldn’t save her own. When I speak at drives, I use the line that “Janet is you, Janet is me, Janet is your best friend, daughter, child, parent, spouse.” But Janet was literally me. 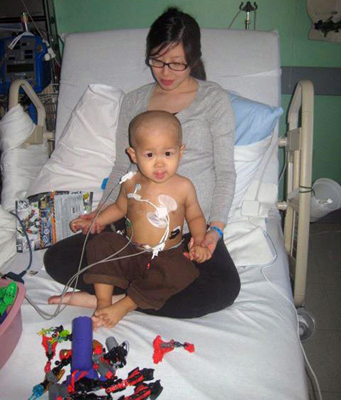 She was a 25 year old Asian American leukemia patient. She wanted to positively impact the world by being a teacher. She was deep and reflective and eloquent, per her blog. She was confused and angry but ultimately optimistic. 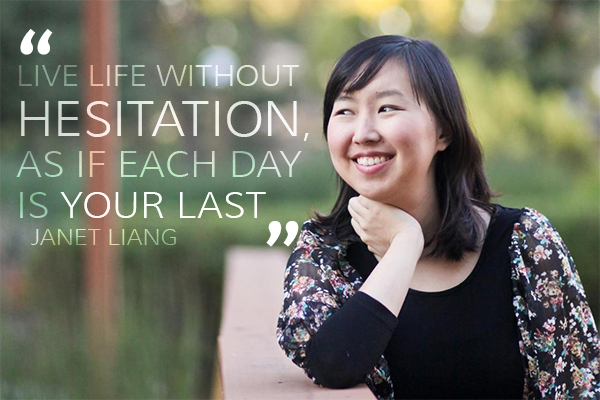 I will remember you, Janet Liang. I will remember you because you are me. You are Andrew. You are those sitting in the beds right now, not believing what they’re going through. You are those sitting in the waiting rooms, hoping for a miracle. The world shines a little less bright today. But Heaven rejoices.